Approaching 2016 begs for a "best of" summary of thus far the most exciting year of my life, sailing over 10,000 miles, from Northern Florida to New Zealand. In that time we've traveled through 10 island/country/territories countries (USA, Cuba, Colombia, Panama, Galapagos (Ecuador territory), French Polynesia, Cook Islands, American Samoa, Kingdom of Tonga, New Zealand) bringing our grand total in the last 3 years of sailing to 25 country/territories! My favorites, in chronological order, starting with New Year's eve, as an on-the-cusp"bonus" pick. Jose Marti Theater, Havana, Cuba. 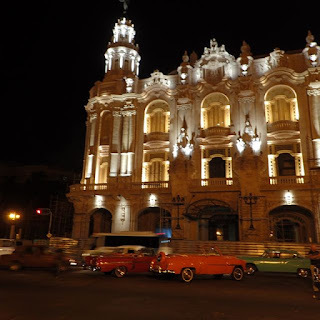 Visiting Cuba before the US opening relations changes its unique culture forever was high on Wayne's and my bucket list. Will prices go up and acquiring lodging become difficult once a growing demand exceeds a rather limited supply? How long before Cuba's classic cars and other quirky transportation disappears? Will it become "Disneyfied" in a desire to please what is sure to evolve in a flood of US tourist cruise ships and flights? 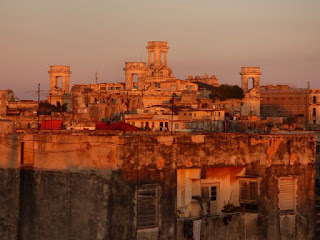 View from our Havana Cuba pensionne. 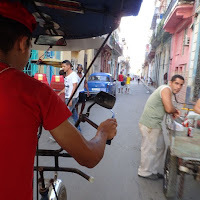 For now at least, we found Cuba affordable, yet rich in culture, vibrant and were touched by the genuine warmth from the people we met. 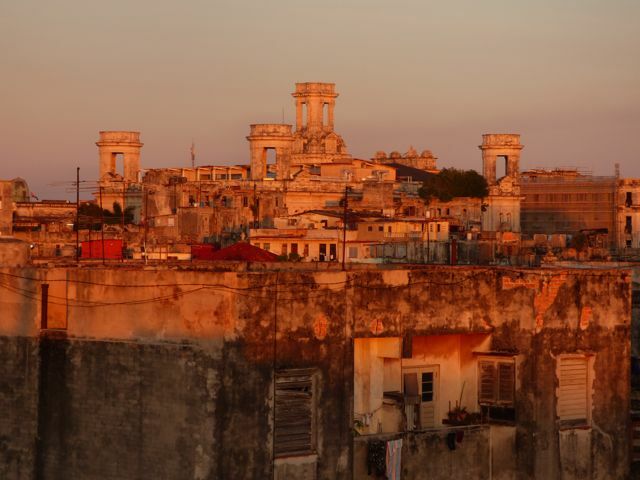 We know Cuba will change, and hope to return and explore it further, while it's still steeped in natural charm. 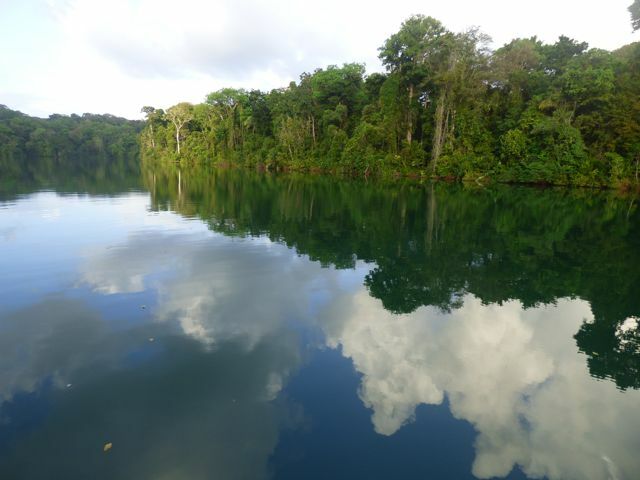 Dawn reflections on Panama's Rio Chagres. While Panama was far from our favorite country (understatement!!! ), the small, wild stretch of Rio Chagres that connects directly to the ocean, just a few miles from crime-ridden Colon, is simply magical. passing freighter, viewed from the visitor center. 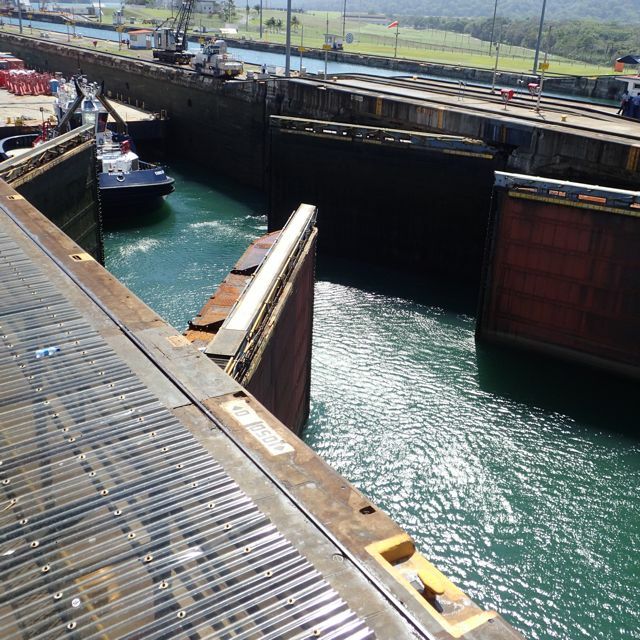 Simply put, the Panama Canal, the primary gateway between the great Atlantic and Pacific oceans is an engineering marvel, a force to be reckoned with. Panama Canal is not on my list because it's a good time (it's not, in my opinion)or because it's beautiful (most of the trip I saw in daylight tended far more towards ugliness, or at the very best functional industrial design). It is on my list because it's intimidating, exciting and awe inspiring. Successfully passing through its locks was one of the greatest early milestones this year in Journey's long journey. Day 2 aboard Journey in the Panama Canal. These locks we passed through in daylight. We are grateful to our loving and tolerant canal crew -- Wayne's father Phil (who started Wayne on cruising over 20 years ago), his lovely wife Gunnel and our dear friends Ron and Tricia Bergman. More ballsy still, we decided late in the game to not use an agent. Despite it all, we "survived." successfully transiting the Panama Canal. 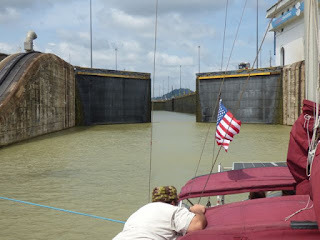 Panama Canal Transit - Survived! Weird and wonderful, Galapagos is the place that inspired Darwin with its unique flora and fauna, adapted to this particularly unusual environment. 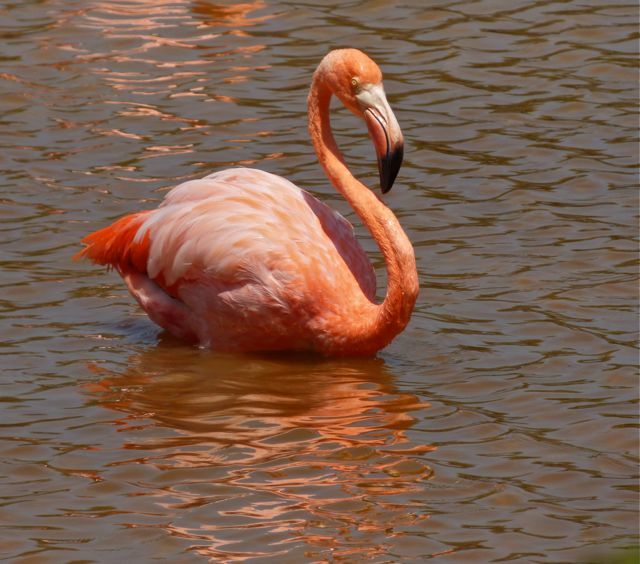 Visiting Galapagos is akin to a marine observational safari. 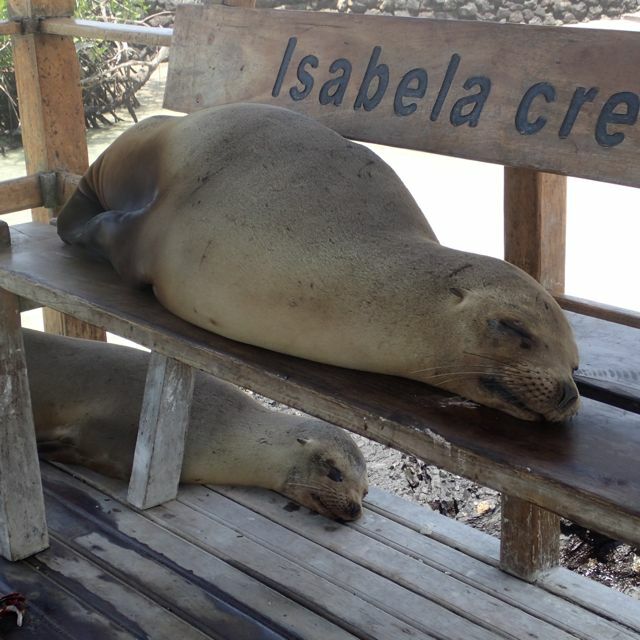 "All" you have to do is get there -- 1,000+ miles was not a trivial distance for us -- and pay -- Galapagos is not a cheap place for cruising boats to visit. 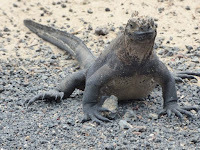 Marine iguanas were rampant on Galapagos. where this gazed upon us. While Panama to Galapagos was only ~25% longer than our Cuba to Columbia passage, if we needed to, upon leaving Cuba there were a number of landfall options between our start and our desired destination. Such was not the case between Panama and Galapagos. It was open ocean, a leap of faith where our path was forward, or failure. 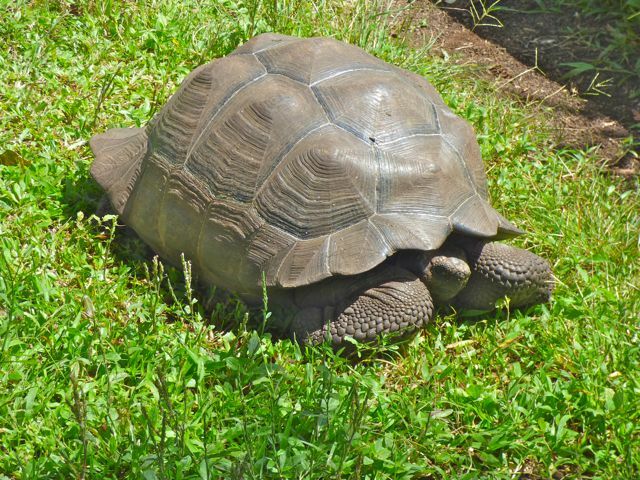 Thus, Galapagos was our second big 2015 milestone, our longest passage by far at that point in time. Despite our initial trepidation, it was our best long passage to date. We recall it fondly, fervently wishing we get at least one more multi-day passage as mellow as our Panama to Galapagos passage. We did indeed see all the rare species we'd hoped to see in their natural environment, as well as enjoy a great guided volcanic trek alongside a recently active volcano. in the Sierra Negra volcanic area. 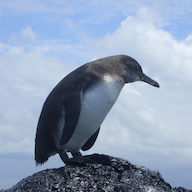 Penguin in the wild of Galapagos - really! Hiva Oa's primary anchorage. We spent several weeks there. 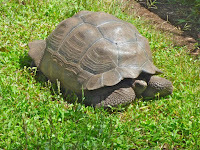 Like Panama to Galapagos, Galapagos to French Marquesas is another point of no return. 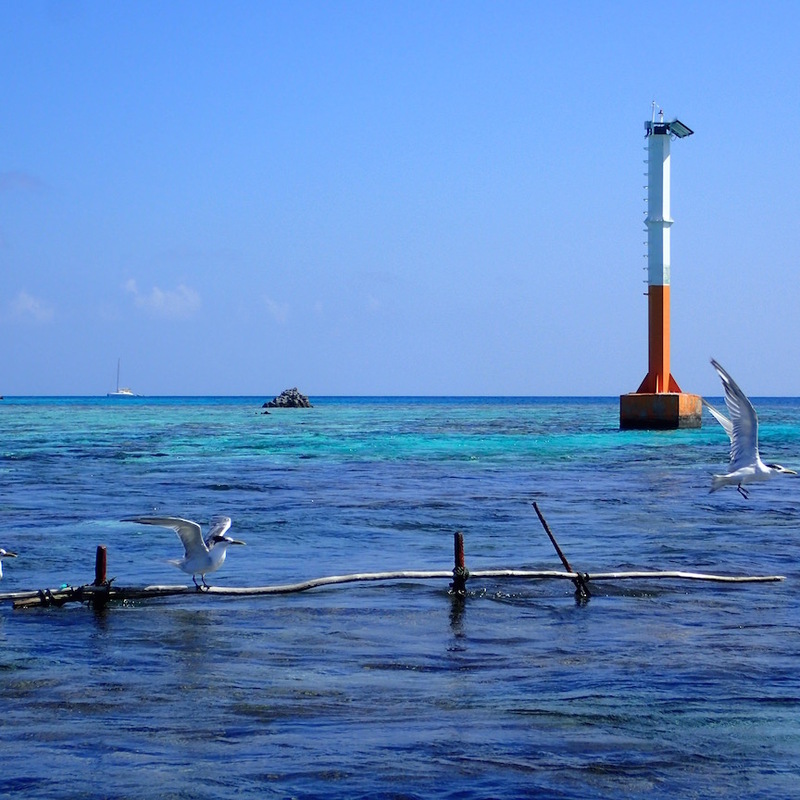 At 3,200 "crow flies" miles, it is the longest unbroken stretch of open ocean in the world. There are few boats who can carry the fuel it would take to motor this distance, which includes a sizable known doldrums (no wind) area. It took us over a month, fraught with boat issues and weather frustrations to complete the passage. 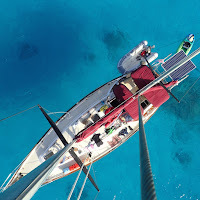 Our challenges continued right up to the very end, when in ensuing darkness, inaccessible fuel, shredded sails, an uncooperative autopilot and dying wind two cruisers kindly towed us in the last two miles into Hiva Oa via dinghy. 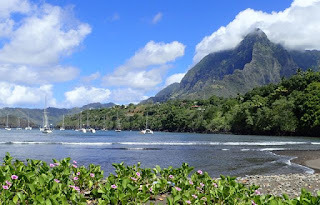 Thankfully, Hiva Oa's blossom-covered isle -- the best smelling place I've been - EVER - ANYWHERE felt like paradise, especially after over a month at sea. 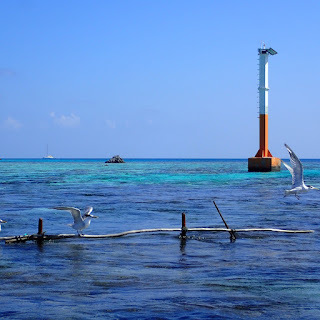 The locals were incredibly cruiser friendly, there was good, fresh food, and the island was also quite pretty. Marquesas Passage - Ready or Not! Marquesas - Mystical & Magnificent! 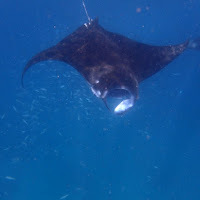 Playful manta ray in Tuahata. Tuahata marks the first time I can recall marine life playing with me. It inspired me to learn more about these intelligent pranksters, manta rays. A couple locals also invited us -- or maybe we invited ourselves -- to join them for a fresh-caught poisson cru supper, complete with cooking lessons. amazing natural sculpture and fantastic ambient light. 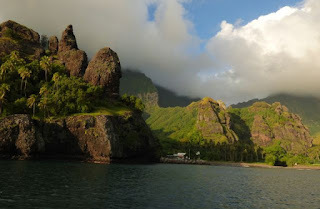 Fatu Hiva's Bay of Virgins is the most surreally beautiful landscape I've ever seen. It seemed simply impossible to to take a bad photo there. Fakarava lagoon by our anchorage. If there was one and only one place in our entire 2015 travels I most wish I could spend more time, it would be in the Tuamotus. Feeling pressed for time, by the time we left the Marquesas, we stopped at only one island in the Tuamotus, and one spot on that island, the Southern entrance to Fakarava. I do believe for only going to one island in the Tuamotus, we picked the best one, even if it was blowing like stink (20+ knot winds) most of our time there. 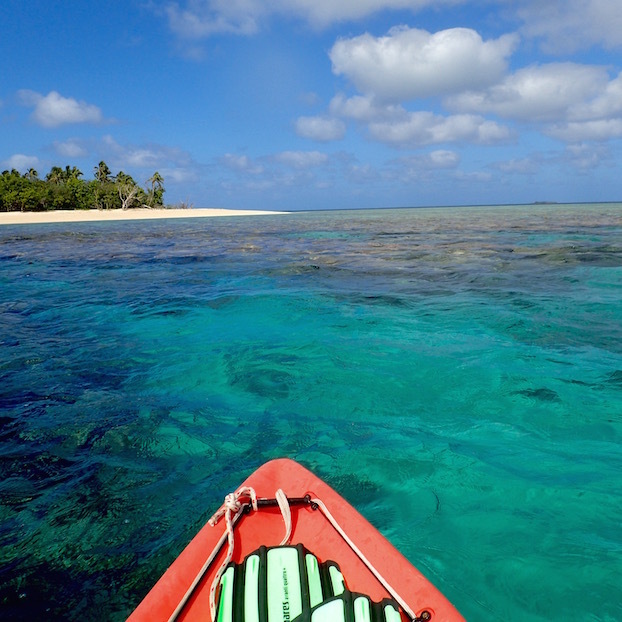 There we saw the greatest abundance of tropical fish, partaking in Fakarava's famed drift snorkel. Additionally, the islands are breath-takingly beautiful. White sand beaches. Waving coconut palms. Gentle shallows. Meandering rivers. Crystal clear, turquoise water. were a few minute kayak from our boat. Envision a pristine tropical paradise, slip in an image of just about any spot in Fakarava, and the fit's picture-perfect. 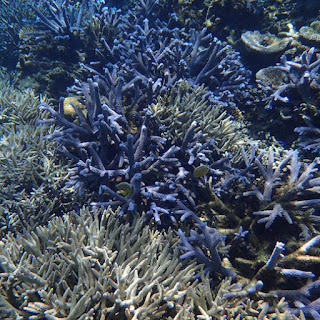 a healthy reef environment. They're not known for attacking humans. Sooty terns in the Fakarava South pass area. Note - My Macintosh died while in the Tuamotus and there no wifi at the boat and few nearby options. 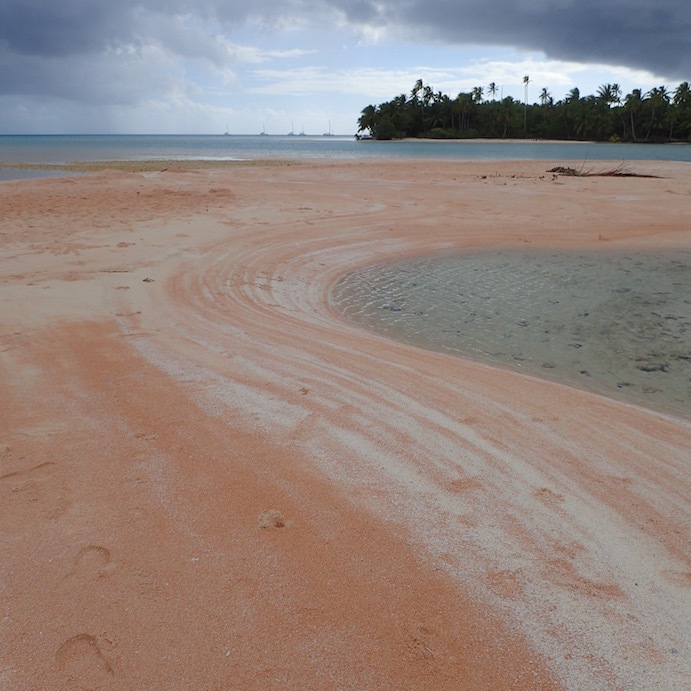 There will be some backfill Fakarava posts, photos and videos. 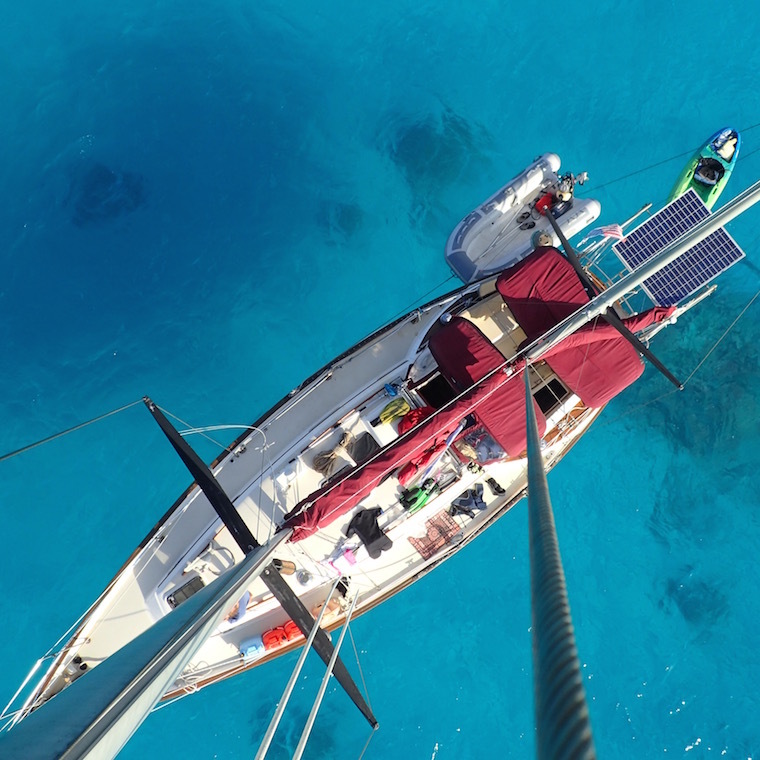 View from Journey's mast, Fakarava. Maupiti overlook. Best viewpoint all year. Theoretically, we were all done with French Polynesia, and checked out of what we considier the highly over-rated island of Bora Bora. We snuck in one last stop, illegally, to Maupiti. We're glad we did -- it was our favorite Society island. Fantastic white sand beaches, the best viewpoint of the year, our one "fun" SCUBA dive of the year, hanging out with huge manta rays, and a concerted local effort to share Polynesian traditions with visitors at a reasonable price with a friendly, laid-back attitude. 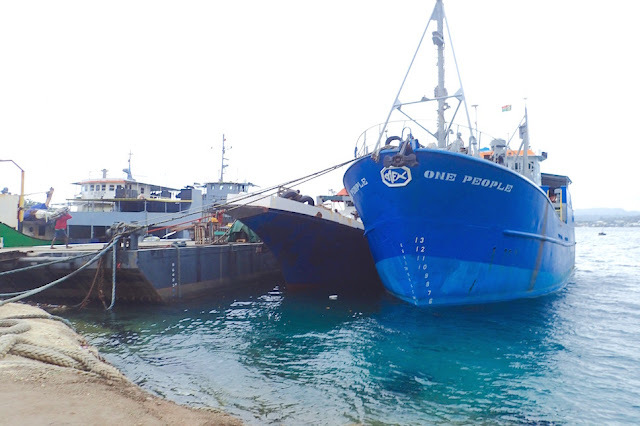 One hitch: Maupiti's narrow entrance can get dangerously nasty; weather windows need to be carefully monitored for trip planning and treated with respect. 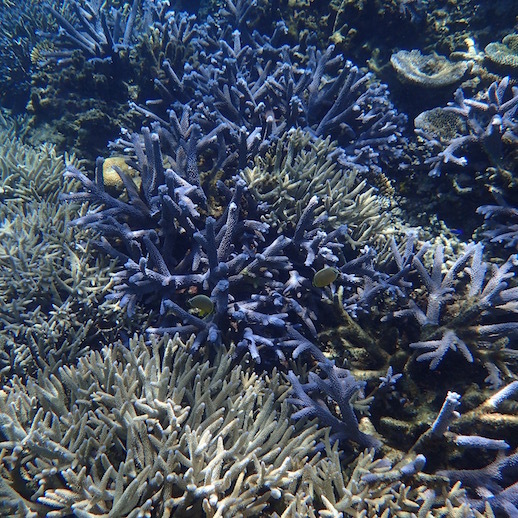 Poking around Uoleva's extensive reef system. 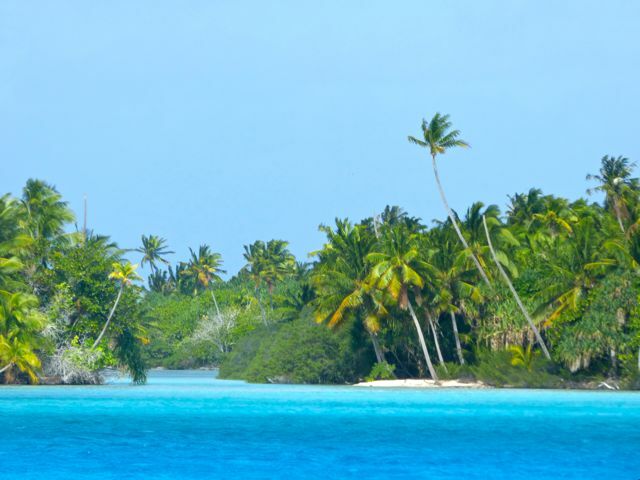 Traditionally, Tonga's Vava'u group is the most popular part of Tonga for cruising. 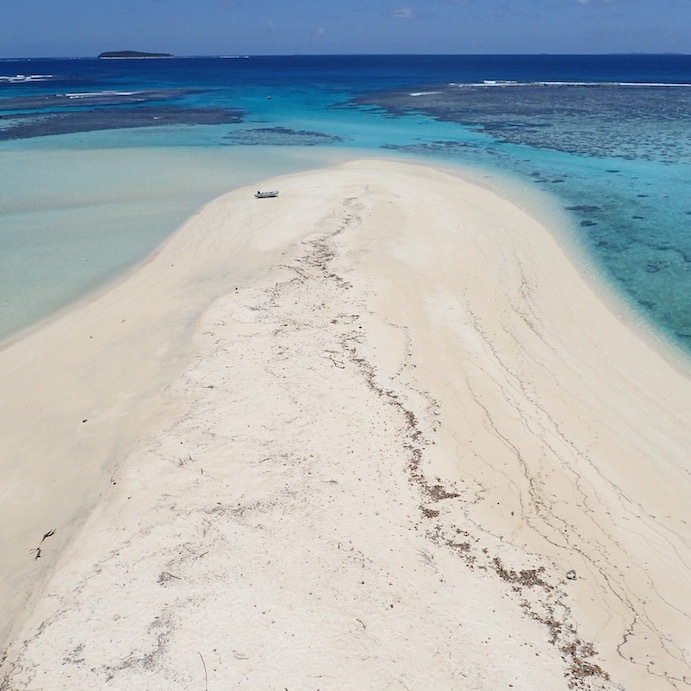 Vava'u's big draw is swimming with whales, but our budget and an early season whale exodus, coupled with lots of crappy weather discouraged us from opening our wallet for a whale swim. 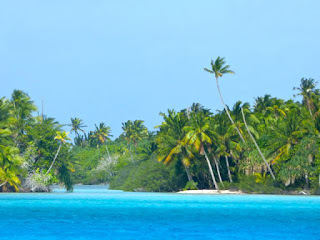 While we appreciated all the efforts the Blue Water Festival folks made in introducing us to Tonga's intriguing culture in Nieafu, Vava'u, overall we were underwhelmed by the Vava'u islands beaches, snorkeling and weather. Ha'afeva's reef appears to be returning to health. 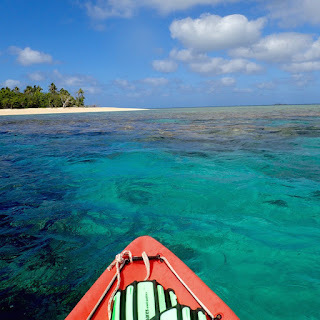 Despite our waning cruising season window, we decided to explore Tonga's less-traveled Ha'apai islands. Fortunately, we timed our Ha'apai cruising perfectly with a return to Tonga's normally nice "dry season" weather. While it's important to go to the Ha'apais well-provisioned and self-sufficient all around, it's worth the effort. Sandy, white beaches, clear water, colorful coral, friendly locals, and pristine islands were a treat. I'd still choose spending more time in the Tuamotus over going to Tonga, but for cruisers with more time, or desiring more interaction with the local culture, the Ha'apais are a special place, special enough to make my top 10 of the places we've visited this year. and remote motu of 2015. This is about as close as Minerva Reef gets to providing "land." 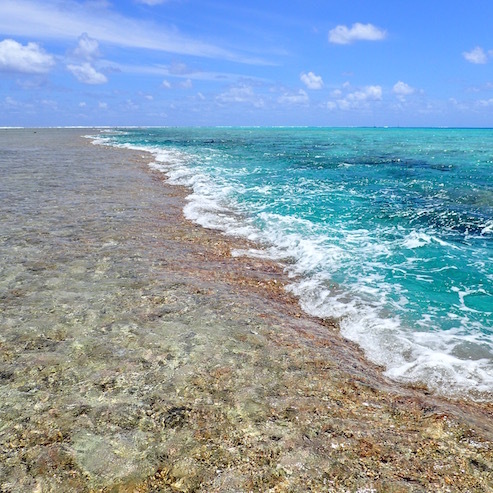 #10 Minerva Reef, "KINGDOM OF TONGA"
Minerva Reef, which is completely submerged all but an hour or so a day, provides a modicum of protection for cruisers sailing between Tonga and New Zealand doing their best to time the 1,100+ trip between doldrums and wicked storm fronts. Roughly it's 275 miles from Tonga's capital, Nuku'alofa, and about 800 miles from New Zealand. 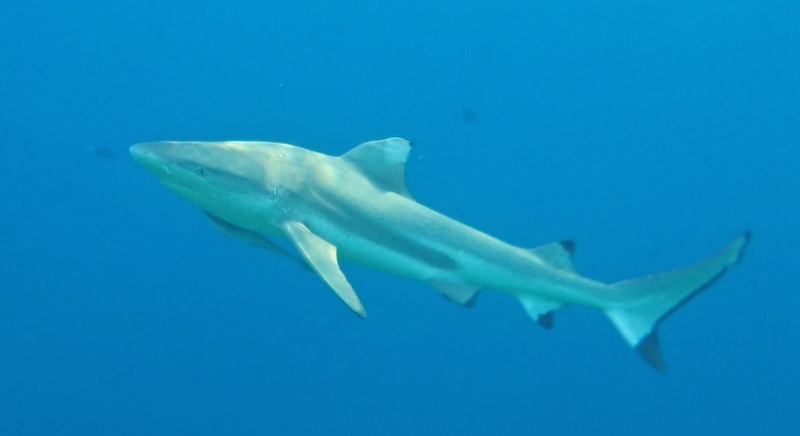 Besides Minerva, there's virtually nothing besides open ocean between Tonga and New Zealand. 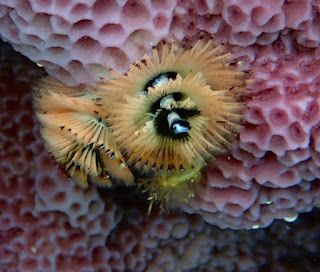 Tiny Christmas tree worm on colorful coral in Minerva Reef. Analysis-Paralysis "Minerva Reef Yacht Club"
What Drives My Top Picks? Snorkeling, kayaking, a strong local culture and impactful events even if they're not entirely pleasant more heavily influence my list. 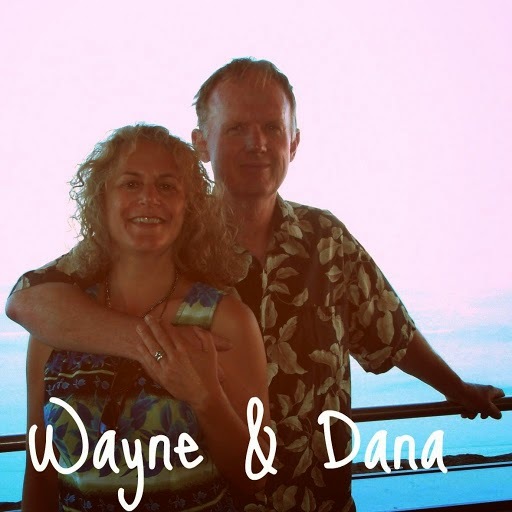 Wayne's Top 10 List differs some from mine, though within my top 20 list, we are in agreement, overall. Really great beaches are a more important driver for Wayne than for me, though I enjoy them too. Are you interested in my Top 20 2015 list (my remaining 10 top picks)? We're currently in New Zealand for safe harbor in cyclone season, which runs from December through May. 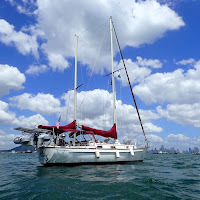 This blog was written while anchored in Waitata, near Russell (S35.15.355 E174.08.021) and pre-posted to run New Year's eve. We expect to be on our way to Whangarei when this posts, quite likely out of wifi range. We left Jacksonville Florida in December 2014, and arrived on New Zealand December 21, 2015, after sailing over 10,000 miles.